Grace Kim (center) at the mission training. Grace Kim has never believed in gender stereotypes. She's never believed that girls should like pink and boys should like blue, or that girls should like flowers and boys should like trucks. But in her mission to someday go to space, she hopes to dispel a different stereotype: That girls can't succeed in science, technology, engineering or math (STEM) careers. 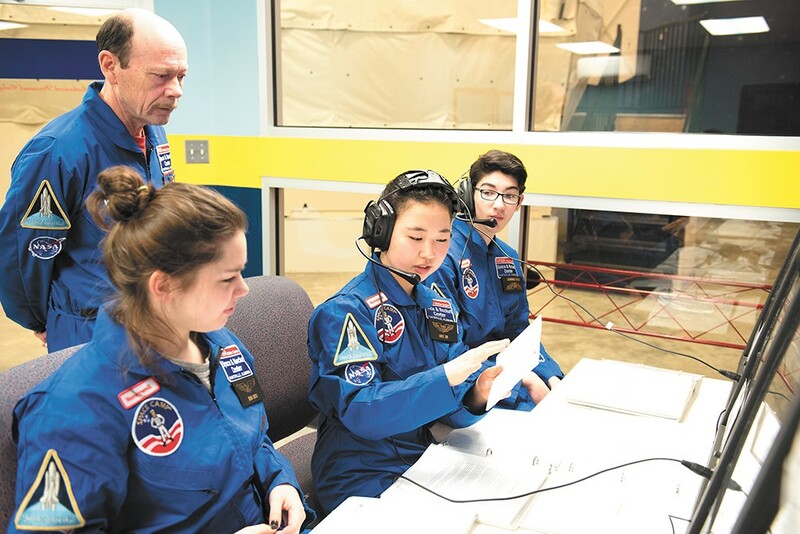 Kim, an 18-year-old Central Valley High School senior, is in her second stint at space camp, otherwise known as the Honeywell Leadership Challenge Academy at the U.S. Space & Rocket Center in Huntsville, Alabama. This year, she was chosen one of eight ambassadors from around the world to lead the camp, which consists of more than 300 students from 45 countries and 27 states. "There's both those stereotypes of 'Girls can't do math, girls aren't engineers, that's a guy thing,'" Kim says. "But now that I look back on these experiences, I think this program has helped me grow into my career of interest, and I'm excited for what's to come." Kim wants to study either bioengineering or aerospace engineering in college, in hopes of one day becoming an astronaut. She's taking classes at Spokane Falls Community College in the Running Start program, and she's considering the University of Washington or some other four-year university in the fall. "I think a lot of students know that they are capable of achieving what they want, given the opportunities," Kim says. "But growing up as a Korean-American, I see these stereotypes that sometimes we don't exactly pinpoint or say out loud, but I think they're hidden, and this is why I am back as an ambassador — I want to be a representative for the ladies." It's not typical that a student is chosen for the Honeywell Academy more than once. The Academy is exclusive to sons or daughters of Honeywell employees, but with hundreds of thousands of employees in the world, it's still a competitive application process requiring multiple essays and a letter of recommendation. The program is two weeks long, and students are able to simulate astronaut training and shuttle missions, meet NASA scientists, engineers and former astronauts, and build rockets. This year, because Kim is an ambassador, she participated in an underwater astronaut training session. She and the other ambassadors entered a giant tank that simulates what it's like to experience zero gravity and not be able to breath through your nose. They all were trained with hand signals used by scuba divers, and they had to coordinate to successfully launch rockets. "My favorite part was launching the rockets," Kim says. Her other favorite part about camp? Making friends who are from different countries. "Every day I'm learning new things about other students around the world, and we learn from each other and work together with our differences, and I think that's a valuable and unforgettable experience," says Kim. Space camp, she says, is much different than school back at home in Spokane. She says it's hard to visualize how she will use what she learns in a textbook in a career, but space camp allows her to see that played out in real life. She's also able to meet professionals in her desired career. She isn't only learning STEM curriculum, but also how to be a better leader and work with a team. Kim says she wasn't always interested in space, because she wasn't sure that as a girl growing up in Washington, she would conquer the obstacles facing women.